Enjoy - Food & Travel: Shopping in Boston - where to go? Shopping in Boston - where to go? Filene's used to be the best known New England department stores, that is until it was bought and merged by its rival Macy's. This actually stirred much emotion by New Englanders. Filene's had been a part of their world, and the world of their parents and grandparents since 1881. Still, Boston has so much to offer shopoholics, both those of you with a well filled wallet and those of you that look for a bargain. The obvious stop of your shopping spree, would be Downtown Crossing, a block away from Boston Common. At 426 Washington Street, you find the famous Filene's Basement. 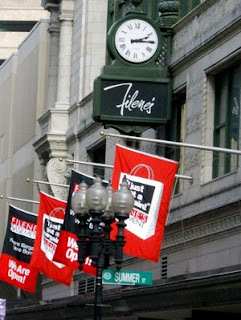 Filene's Basement is famous for its automatic markdown system, that allows you to buy clothes at reduced prices. At Downtown Crossing you find Macy's, and other well known brands as TJ Maxx, Marshalls, the Swedish H & M. Along Washington Street you find a large variety of shops. Here you find some of the best Jewellry shops in Boston. If you would like to dig deeper into your reserves you are adviced to visit Back Bay, and in particular Newbury Street with its galleries and designer shops. This is also a great place for finer dining in Boston. The area around Harvard square is also a great place to shop. One of my favourites, is the CambridgeSide Galleria, situated at 100 CambridgeSide Place, by the Science Museum in Cambridge. For Directions: Take the Green line to Lechmere, take 1st street, and turn right along Cambridgeside Place. Here you find everything under one roof, and most well known brands can be found here. And if you get hungry there are some decent restaurant and a nice food court here.